Earth's temperature soared to a record high last month, nearly 1.5C degrees above average as measured by weather satellites. That's a huge amount even in these record-breaking atmospheric times according to scientists at the University of Alabama in Huntsville. To put that in perspective, a 1.5C degree rise is the line in the sand established at the Paris Accords as not to be exceed by 2100. As February broke new weather ground, the month ended with Leonardo DiCaprio's long-anticipated Oscar win. Indeed, the story that was the most tweeted Oscar moment of all-time was the mega star's speech following his Best Actor victory in The Revenant. "Making The Revenant was about man's relationship to the natural world. A world that we collectively felt in 2015 as the hottest year in recorded history. Our production needed to move to the southern tip of this planet just to be able to find snow. For our children's children, and for those people out there whose voices have been drowned out by the politics of greed." Millions of fans whom DiCaprio will never meet cheered his courageous words. With the Republican Party seemingly poised to nominate a celebrity climate-denier as the 45th President of the United States -- with what may be the heaviest eco-footprint in America -- it was appropriate that DiCaprio use his celebrity spotlight to remind the world of the looming threat to all of us. 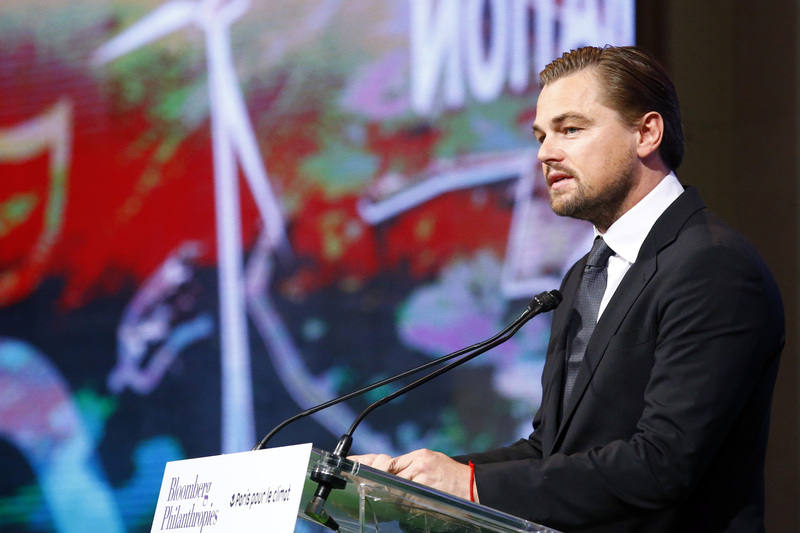 DiCaprio deserves high praise for his nearly two decades of dedication to reducing carbon pollution, and his unwavering support for climate scientists and environmental activists. However, one man -- as powerful and popular as Leo is--cannot fight climate change alone. DiCaprio may never win another Oscar. He may never have another opportunity to urge tens of millions of viewers to join the effort to preserve a livable planet. So kudos to Leo for issuing this call to action while the world was watching. But now what? For me DiCaprio's plea prompts the following question: How CAN and where DO Americans work collectively to fight climate change? The crisis, and other environmental challenges, need and deserve comprehensive ongoing national television coverage. Where and how else are we supposed to start talking about it as America's favorite leading man implored us to do? Perhaps one reason average citizens are not as concerned and ready to act as they should or could be is they don't see regular coverage in the news and almost NEVER see solutions-oriented programming. It doesn't yet exist. That void is a huge opportunity. As a seasoned broadcast news journalist-turned-Green talk show host, I have spent more than a decade advocating for dedicated programming on these timely, complex and changing stories. For inexplicable reasons network news programmers have failed to see the "green light" and tend to view such shows as "too niched" or "too negative." But it's a niche that affects all of us and If Americans are all about hope, fortitude, ingenuity, patriotism, can-do spirit and unwavering commitment to our children's future then why not take on our most pressing environmental challenges? The most egative consequences will only be the outcome if we continue to ignore warning signs to act. Where is it written that the eco-evolution shall not be televised? Why not chronicle the biggest story of our time, what's happening to our life support system before our eyes? It's so much more than ONE story (see www.thegreenfront.com and www.ecotalkradio.com). The worsening climate crisis can most effectively be addressed with a concerted and comprehensive effort by mainstream news media, in both print and traditional broadcast/cable outlets. Only major networks and newspapers have sufficient resources to cover threats of this magnitude-- and emerging opportunities-- with the depth, breadth and long reach needed to be accessible by the mass public. Progressive online news sites and social media alone cannot provide the trans-partisan discussions needed if we are to come up to speed quickly on what we are facing and what we can do to be "part of the solution." It will require more than 140 characters and an attention span of more than a minute if we hope to succeed. So while a call to action from even a high-profile figure, and global platform like the Oscars is a great and needed step it should serve as launching pad for a nationwide awareness campaign focused on the challenges posed by climate and other threats to nature, our life support system, as well as dynamic conversations on proposed and varied solutions from the best and brightest among us. Personalities on the frontlines of sustainability are knowledgeable, passionate, hopeful and deserve to be widely seen and heard in 2016. Why not tap into their collective wisdom? There are hundreds-- actually thousands-- of change makers in the trenches from science, politics, business, activism, the arts and beyond eager to participate in conversations about solutions. As DiCaprio told ABC's Robin Roberts backstage after the Oscars, we need more citizens to get educated and taking action. Now. "As I said in the speech, it is the most urgent crisis that we've ever faced as a civilization and the more people that talk about this and get involved and, as I said, vote for leaders who really want to make a difference, you know, we can actually tackle this problem. We have the capacity to go 100 percent renewable using existing technologies, we just have to have the political will. Our very existence is at stake." Or put another way, if we don't act soon, and icebergs continue to melt, we may all be in for a titanic amount of trouble. Since no one wants that, what are we waiting for?